With a city population of nearly 800,000 and a total metropolitan area population of over 1,500,000, Indianapolis is 13th largest in the United States in city population and 29th in metropolitan population. This is large enough to support a richly diverse cultural environment yet small enough to maintain an affordable and neighborly community. 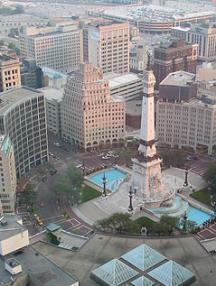 Downtown Indianapolis (a few minutes from the IU Medical Center) is the city's crown jewel. It is a classic example of urban restoration in the midst of new hotels and office buildings of outstanding architectural design. It supports a range of activities, from shopping to fine dining, from sporting events to musicals. Day or night, something exciting is happening in downtown Indianapolis! The surrounding neighborhoods have a variety of activities to offer as well. Broad Ripple is the heart of the art community, hosting the region's largest outdoor art events. Eagle Creek Park, a 4,200-acre natural park, is a haven for the outdoor enthusiast as it is home to trails for hiking or biking, courses for golfing and a reservoir for sailing or rowing. Indianapolis is a great place to work and to live. It offers the best that can be found in the largest cities in the world at a cost and convenience that the larger cities find impossible to match. Please take a few minutes and explore what our city has to offer in your area of interest. For lovers of the arts, the city has plenty to offer. From world-class musical organizations such as the Indianapolis Symphony Orchestra, the Indianapolis Opera Company and the Indianapolis Children's Choir to such renowned dance troupes as Dance Kaleidoscope and the Russian Ballet Academy, the performing arts are lively and varied. Add to this live theater - the Indiana Repertory Theatre for traditional and contemporary plays, the Phoenix Theatre and Theatre on the Square for experimental works, The American Cabaret Theatre, Clowes Hall and the Murat Theater for musicals, the Civic Theatre for community productions - and you'll find plenty of reasons to go out when time permits. The internationally acclaimed Indianapolis Symphony Orchestra is among a select group of America's finest. The orchestra attracts and presents resident and visiting artists of the highest stature. More than 180 radio stations air the orchestra's nationally syndicated broadcasts to markets of over 100 million people. The orchestra performs at the downtown Circle Theatre, a 1,833-seat, neoclassical architectural triumph with extraordinary acoustics that was completely restored in 1982. Each summer, the orchestra performs a series of outdoor concerts called Symphony on the Prairie. This event takes place at Conner Prairie where an outdoor amphitheater is surrounded by large grounds for picnicking. Bring your fried chicken and potato salad, or your wine and cheese while you listen to the music and relax on the lawn. The visual arts are lively in Indianapolis. At the Indianapolis Museum of Art, the Eiteljorg Museum of American Indians and Western Art and the Indianapolis Art Center, you'll find everything from artifacts and antiquities to contemporary artworks. What's more, there's a lively gallery scene, with such places as Herron Gallery (part of Indiana University's Herron School of Art), Hot House Art Gallery, 4 Star Gallery and Ruschman Gallery leading the way with the latest works from local, regional and national artists. The Indianapolis Museum of Art (pictured above), which houses an extensive collection of Old World, Oriental, and contemporary masterpieces, is nestled in midtown Indianapolis on 154 acres of manicured grounds and botanical gardens. In addition to the main building, which houses the museum's art collection, is the Museum of Decorative Arts in the former mansion of the Eli Lilly family. Also on the museum grounds is the Garden on the Green, a popular restaurant, which features an eclectic menu and beautiful views of the museum grounds. The Indianapolis Art Center, housed in a building designed by internationally renowned architect (and Indianapolis native) Michael Graves, is one of the largest community arts organizations in the country. In addition to offering an array of visual arts classes in everything from drawing and painting to glass blowing and metal smithing, the Art Center hosts exhibitions, film series, lectures, and concerts. Every May, it also sponsors the Broad Ripple Art Fair, one of the region's largest outdoor art events. Annual artistic events occurring in Indy include the Broad Ripple Art Fair, the Penrod Art Fair, and the Talbot Street Art Fair. Each of these is an outdoor event where you can enjoy not only the talent-filled artwork but also the fresh air and sunshine! The Children's Museum, the largest facility of its type in the world, has numerous visual and hands-on exhibits for young and old alike. It also features a planetarium, an Omnimax theatre, an operating carousel, and an auditorium where singers, puppeteers and children's theater groups perform. The Indiana State Museum provides educational exhibits that illustrate Indiana's geologic past, its archaeological heritage, and political and cultural history. Located just north of Indianapolis, Conner Prairie is a living museum where patrons can travel back to Indiana in 1836. Interactive activities include dipping candles and playing 19th century games. For those who prefer to be entertained, sit back and enjoy the Indianapolis Symphony Orchestra play at the outdoor amphitheater. Indianapolis is a mecca for sports buffs, and many world-class sports facilities - including the IU Natatorium, the IU Track and Soccer Stadium and the Indianapolis Tennis Center - are on our campus. In Indianapolis, unlike many other cities, the public may use those facilities whenever they're not in use for competitions. Since 1982, the city has hosted an array of national and international sporting events, including the Pan-American Games, the World Gymnastic Championships, rowing championships (Eagle Creek Park, on the city's westside, is home to the only rowing course in the country sanctioned for international competition) and U.S. Olympic trials for several summer sports. For the professional sports enthusiast, Indianapolis is home to the 2006 Super Bowl Champion Colts and the Indiana Pacers. You can also watch the Indianapolis Indians AAA baseball team in the new Victory Field stadium, within walking distance of our campus, and the Indianapolis Ice CHL hockey team at the Coliseum in the Indiana State Fairgrounds. And there's auto racing at the Indianapolis Motor Speedway. The Indianapolis 500, held every Memorial Day weekend, is still the granddaddy of all races, though the Allstate 400 at the Brickyard, a NASCAR race held at the Indianapolis Speedway each August, is equally popular, you can also check out US Grand Prix racing. In September 2000, the Speedway hosted its first Formula One event. And the National Hot Rod Association's US Nationals, held in late August at Indianapolis Raceway Park, attracts drag racing buffs from around the country. The NCAA has staged various championships in Indianapolis, ranging from swimming and diving to track and field and basketball (the Final Four was here in 1997, 2000, 2006 and returned in 2015). Every May, the city hosts the Mini-Marathon, which attracts over 17,000 runners and walkers, making it the largest half-marathon race in the United States. The level of support for and commitment to amateur sports led to Indianapolis being chosen as the home of the NCAA's headquarters, located on a site adjacent to our campus. On campus is the IU Natatorium, a world-class aquatic facility with separate diving, competition, and instructional pools. Also included in the Natatorium are racquetball and handball courts, a weight room, an aerobics room, and a gymnasium. Adjacent to the natatorium are outdoor basketball courts. Nearby is the IU Track & Soccer Stadium, which seats 12,800 and contains a 400-meter, eight-lane track. It is surrounded by soccer fields, softball diamonds, and basketball courts - all available for your use. The 10,000-seat, 24-tennis court Indianapolis Sports Center is the site of the RCA/U.S. Men's Hardcourt Championships, as well as other tennis events. A few miles from the campus is the Pan American Plaza, which contains the nation's finest indoor ice-skating complex. Three miles north is the Major Taylor Velodrome and BMX Track, offering national and international bicycle racing, recreational riding, instruction, training, and bicycle motocross racing. Just south of campus lies White River State Park, a 250-acre park on the White River, and the Indianapolis Zoo, a $200 million complex. The zoo features more than 2,000 animals in "cageless" simulated natural habitats and is a retreat for family recreation. An IMAX theater is part of the White River State Park. For those who love the outdoors, Eagle Creek Park is within the city just 20 minutes from the medical center campus. A 4,200-acre natural park located on a 1,300-acre reservoir, Eagle Creek offers boating, crew racing, swimming, hiking, golf, archery, cross-country skiing, picnics, and nature studies. Competitive 5K and 10K runs are held in the park throughout the year. In addition to Eagle Creek, Indianapolis has wonderful parks throughout the city, with facilities ranging from swimming pools and tennis courts to golf courses, baseball diamonds, basketball courts, and hiking trails. What's more, Indiana maintains numerous state parks within an hour or two of Indianapolis. You can canoe Sugar Creek or Whitewater River, hike through grottoes and dense woods in Turkey Run and Shades, go caving at McCormick's Creek State Park, whiz down the toboggan run and ski the cross-country trails of Pokagon, examine the Indian mounds at Mounds State Park, ogle the fall foliage in Brown County, and contemplate the falls at Clifty Falls. For cyclists, Indianapolis has a network of biking trails as part of the Indianapolis Greenways, among the more popular of which are the Monon Trail and the Central Canal Towpath. For more of a challenge, there's the annual Hilly Hundred tour or the country roads of southern Indiana. While the area has many shopping malls, Circle Centre Mall is the city's premier shopping destination. Circle Centre is located in the heart of downtown and is anchored by Carson Pirie Scott department stores. In all, there are approximately 110 shops in the multilevel facility, as well as several restaurants, a cineplex and nightclubs. On the north side, Keystone at the Crossing provides another unique shopping mall anchored by Nordstrom's and Saks Fifth Avenue. The mall is part of a larger shopping extravaganza with surrounding smaller malls housing stores ranging from ZanyBrainy to Bed Bath and Beyond to Barnes and Noble. Finally, intermingled restaurants featuring cuisine from hamburgers to steaks make this area of the city a great place to spend the day shopping. Finally, each side of town features its own shopping mall with anchor stores such as Macy's and Saks Fifth Avenue. So if you just want to run to the store to pick up that blouse you need to go with the skirt you want to wear out to dinner that night or to buy that specific screwdriver you need to finish hanging your new storm door, you don't have to run far. The city hosts a huge variety of ethnic and specialty restaurants, including Afghan, African-American, American, Cajun, Caribbean, Chinese (Hunan, Szechwan, and Mandarin), Creole, Dutch, Ethiopian, French, German, Greek, Indian, Irish, Italian, Jamaican, Japanese, Korean, kosher, Mexican, Middle Eastern, Russian, Thai and Vietnamese. Each summer, the city hosts two street festivals: Midsummer Fest and Circlefest. Downtown is closed to vehicles, open-air restaurants line the sidewalks, and festival goers can dance or listen to live bands playing a variety of music as they enjoy their sidewalk cuisine. In addition, cultural communities celebrate their heritage each summer at events such as the Greek Festival or the International Festival.